Sushi and Rio de Janeiro are not known as a great combination, but the Marvelous city has a lot to offer when it comes to Japanese food. If you are looking for some awesome places, we selected the six best sushi restaurants in Rio de Janeiro. Hidden in the back streets of Copacabana, Azumi is an old time favorite for sushi lovers. Run by the Ohara family, this eating house has around 500 menu options. Guests can take a seat at the bar to try grilled appetizers. They can be adventurous and order a dish with monkfish liver. Maybe try some yakitori, chicken and scallion skewers, marinated in a savory sweet sauce? The Oharas also offer great yakisobas, fried noodles with seafood or meat and vegetables, from the South of Japan. Any doubts? Just go there and a big chance you’ll bump into Japanese clients enjoying their food. techniques with constant innova tions. Check out their semi-grilled tuna fish with Foie gras, brunoise of green apple and wasabi sauce, or their white fish usuzukuri (slices of sand perch, marinated in lemon and sake, mixed with truffle oil). 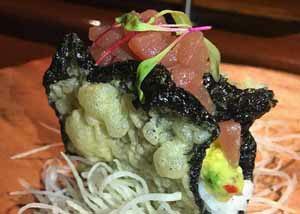 Its pleasant ambiance and great service have turned Sushi Leblon a favorite for local celebrities. If you’re looking for excellent food and a romantic night out in Rio’s lush green Botanical Garden neighborhood, look no further. Enter Yumê and pass straight through it Imperial room, by the sushi bar and make sure to get a table in the garden, glasshouse: the Zen Space. Here you see can see the stars at night, while seated at typical low Japanese tables. Located in a monumental villa, the kitchen is commanded by Chefs Edvan Medeiros, Jefferson Pacheco and Francisco Alves. 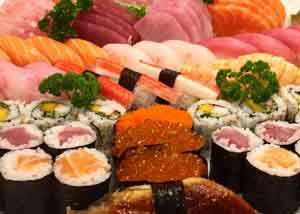 Make sure to try their sakura mango sushi (seaweed roll with mango and salmon eggs), or tuna, salmon or octopus sashimi. Located in an alley in the downtown area, close to Cinelandia square, is a hidden all-you-can-eat (rodízio in Portuguese) sushi eatery. While Hachiko serves a wide range of Japanese dishes, the western influence turns their food into a contemporary, fusion experience. Besides tasty sushi and sashimi, their creative combinations of salmon and fried duck balls with mango chutney are highly recommended. 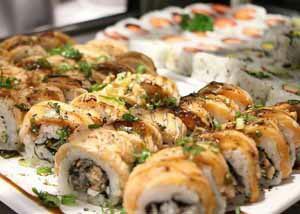 Tucked away in the small neighborhood of Leme, Sushi Akyrio is a casual restaurant with a tranquil atmosphere. 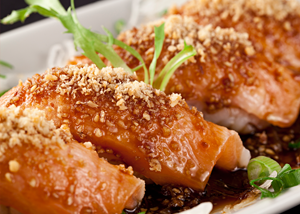 Tekamaki, sushi, sashimi and a variety of yakisoba (noodle) dishes are stars of the menu. 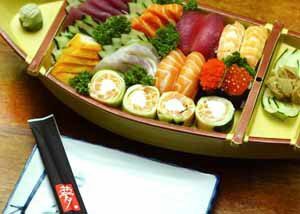 Sit at their bar to see sushi boats prepared in front of you. Different combinations are presented with care and an eye for detail. Their cocktail menu of creative, original drinks are worth a look as well. Give your taste buds a go with the Plum Dew Orange Dry, a mix of Japanese plum liqueur with gin, orange and ice. 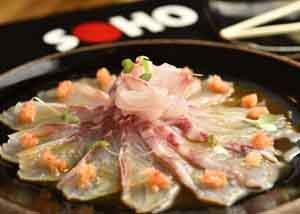 Newcomer Soho opened its doors in 2016 in Rio de Janeiro, a branch of the reputed Soho restaurant in Salvador da Bahia. 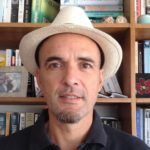 With chef Rafael Hidaka responsible for the menu, Soho is located in the recently renovated harbor, Marina da Gloria. The views of the Bay of Guanabara can make dining in Soho a truly inspiring experience. Soho shrimp tempura ( garnished with spicy mayonnaise) is great for a starter. One of the chef’s signature dishes is shogayaki beef (grilled filé mignon, with a base of soy, sake and ginger).